Today it’s Friday. The official Friday song is on the speakers and I have completed my fifth week at Oriflame. I think the time is running to quickly and I do not want this fantastic experience to be over. Luckily I have 3 weeks left. 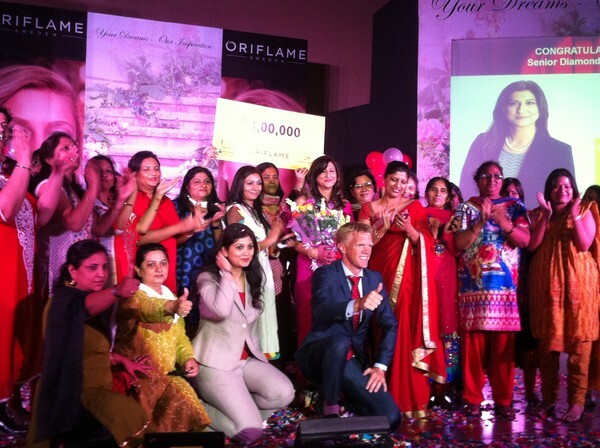 I really enjoy my time at Oriflame and in Delhi and people ask me why I do not travel more. Of course it is a legitimate question, but for me is so obvious. 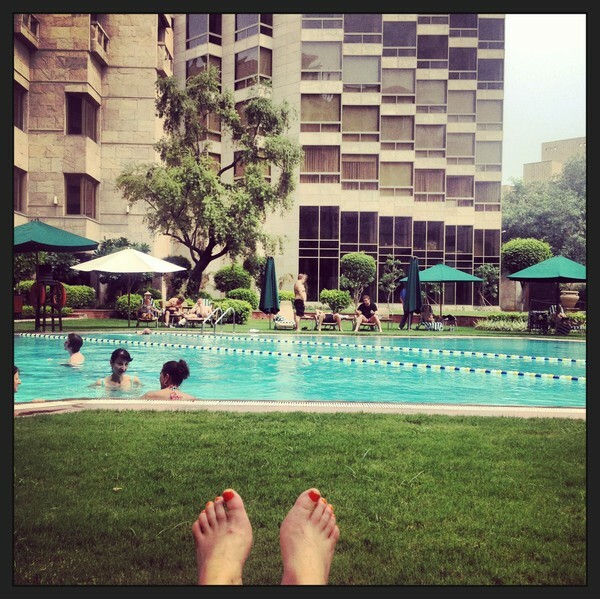 I love Delhi and I want to spend my spare time here as well. Despite this I travelled to Agra last Saturday in order to visit the fantastic monument Taj Mahal. Agra is situated 3,5 hours with car from Delhi (Delhi Traffic), it is the same distant as from Helsingborg (my hometown) to Gothenburg (approx. 200 km.). Taj Mahal It is one of the most beautiful building I have seen. The symmetry in the architectural structure was unbelievable. 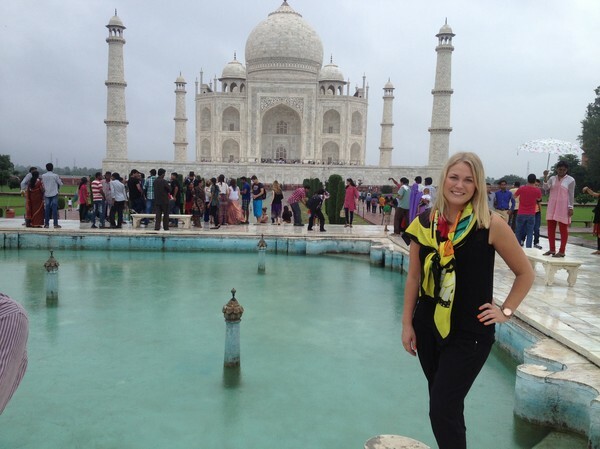 I recommend all of you to go to Agra and enjoy this experience! DO IT! My project is moving forward. I have done a first PPT draft that I will present for my colleague on Monday in order to get constructive feedback on my recommendations, everything to deliver the best project as possible. Today I had a call meeting together with Johan Bjurman Bergman. He is a Global Summer Intern in Istanbul. We shared our best practices and gave feedback on each other’s presentations. Thank you Johan! Now I am going to be efficient some hours before the weekend. The last weeks have been filled with exciting and challenging experiences…let me start by introducing the main source for my excitement, my assigned project! 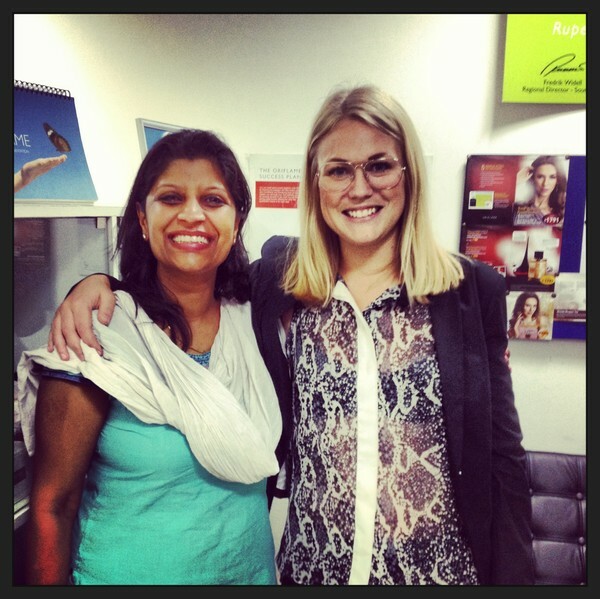 During this summer I will work with oriflames wellness category in relation to the upcoming launch in India. The project entails a number of objectives which are broad, hence encouraging own creative ideas and input. However the main focus is to map, analyze and get an in-depth understanding concerning the competitive landscape on the Indian market. In order to be thoroughly prepared for a wellness launch I’m also closely interacting with all our 15 branches in India and top consultants from different regions across the country in order to get an understanding about regional differences needed to be taken into account, from among other things, a marketing perspective. The project has already taken my out on various exciting and challenging fieldtrips around Delhi for data gathering and it’s much more to come! Moreover, last week we moved in to our new World Class Office here in Delhi, more specifically in south Delhi, in the area called Jasola. It’s truly a remarkable office and one can both see and feel the happiness among all the colleagues. We are all very proud when we entering the door to the office in the morning (..especially, after battling with the heavily congested Delhi traffic J) . During the weekend we visited Kingdom of dreams to see one of Indias most famous bollywood stories Zagoora, the gypsy king, get illustrated on stage. 2 hours of colorful Indian culture captured in extraordinary song and -dance numbers was truly an experience that I will cherish for a long time. Today I want to describe my project in more detail. My project is called: "Increase the Product Culture in Oriflame India". This project is very extensive and the content of the project depend on how product culture is defined. The aim of my project is to improve the product culture internally and externally in India, where internally means the employees at Oriflame and externally the consultants. That is a short description of my project in. It is a very interactive and challenging project, because of the lack of numbers and clear measurements. I have got the opportunity to talk with employees all over India, with many leaders in India and the opportunity to work in different teams here at the HQ, since my project involve many departments. In Oriflame it is all about taking own initiative and to shape your own project. I am also doing two projects besides my main project. These projects focus on to improve the Launch material towards the consultants and internally, with focus on the main Launches in 2014. I am going to create a 360 degree launch plan for these launches.. Since I have been at the field and visit leaders I want to show you some pictures. The lady Sangeeta, is #3 in India. She is fantastic! Have a great Weekend, we will in Delhi! 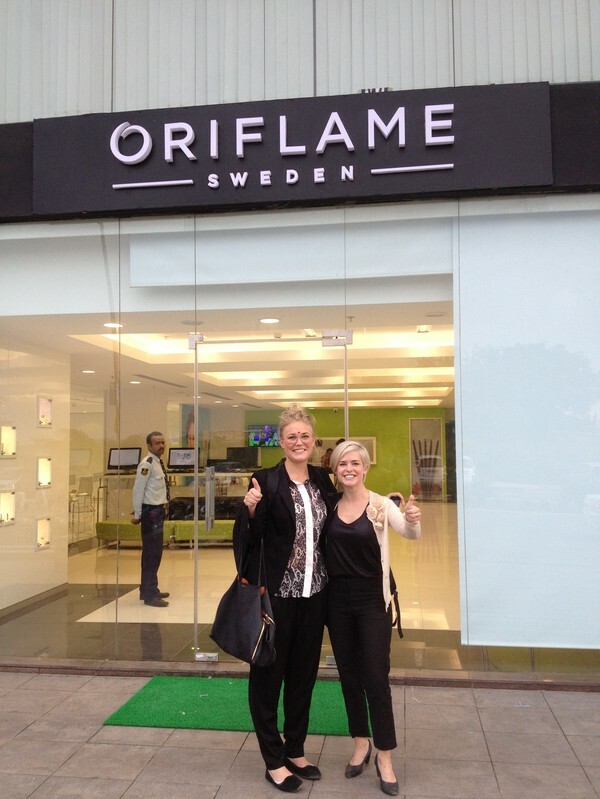 Welcome to follow our exciting summer internship at Oriflame New Delhi, India. We joined two weeks back; however it feels that the time is passing by way to quickly. In this short period of time we have got a thoroughly introduction including important insights from all different departments within the organization. We have among many things been visiting the manufacturing facility located 30 minutes outside Delhi, more specifically in Greater Noida. Furthermore we have also got the great opportunity to participate at a 'Success Seminar' aiming to motivate and interact with the fantastic consultants. While we are writing this post we are sitting in a cosy French cafe in Haus Khaz Villiage, which has become our favorite place to spend our spare time. In this genuine little charming village you found small jewelry boutiques, design clothes as well as a range of splendid restaurants with international appeal. We went here directly after a inspiring day at the office, as we attended our first catalogue launch here in Delhi. The event was totally FANTASTIC! We cheered, laughed and even shared a tear while hearing the honest and powerful testimonials from the leading consultants. Today when interacting with the consultants, we realized the power of the business opportunity at Oriflame and how Oriflame truly can fulfill people dreams. The top consultant which received a remarkable recognition today shared how Oriflame changed her life from being a housewife to a successful business women, which has resulted in that she can afford to send her son the an IVLY School. 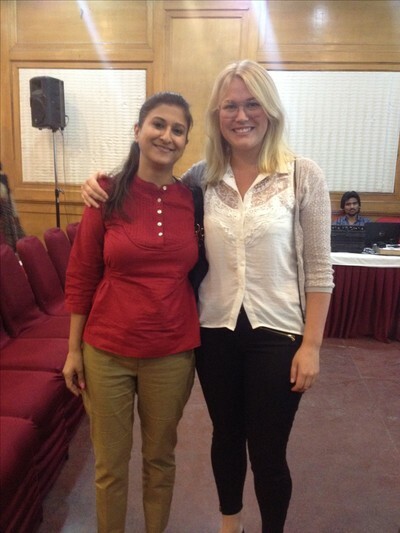 We will share some pictures from our first two weeks in Delhi and at Oriflame. In the coming week we will introduce you to our individual projects that we will work hard with during this summer. 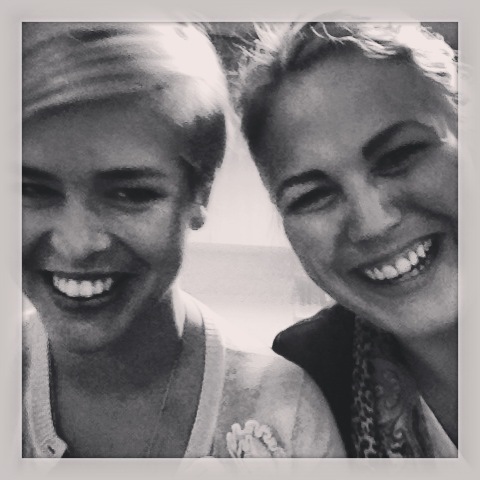 Malin and Kendra at the Factory visit. Kendra and Malin at the Catalogue Launch. The Oriflame thumb! 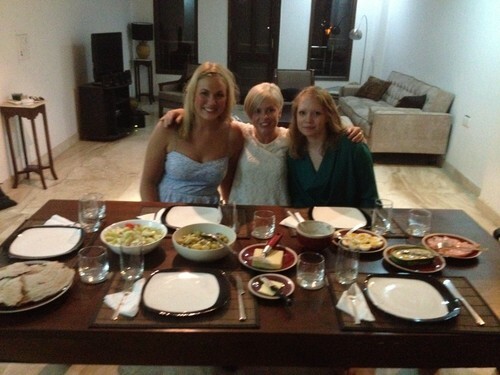 Midsummer Party at our friends house. Malin swimming in a pool at a five star hotel that we checked in to in order to use the relax on a Sunday. Niklas (MD of India and Head of South Asia), Shefali (Area Director) with fabulous consultants at the catalogue launch the first of July.